Oscar Movie: "The Lord of the Rings: The Return of the King"
After defeating the army of Orcs at Helm's Deep, Gandalf (Ian McKellen) heads to Gondor to warn them of an impending attack, while Aragorn (Viggo Mortenson) tries to convince King Theoden of Rohan (Bernard Hill) to lead his army to Gondor, despite Gondor not helping them at Helm's Deep. Meanwhile, Frodo (Elijah Wood), Sam (Sean Astin) and Golum (Andy Serkis) continue their journey to Mount Doom. The ring is starting to weigh heavily on Frodo's heart and he will fall deep into darkness if they don't destroy it soon. If successful in destroying the ring and defeating Sauron, Aragorn can then take his rightful place on the throne as King of Gondor. 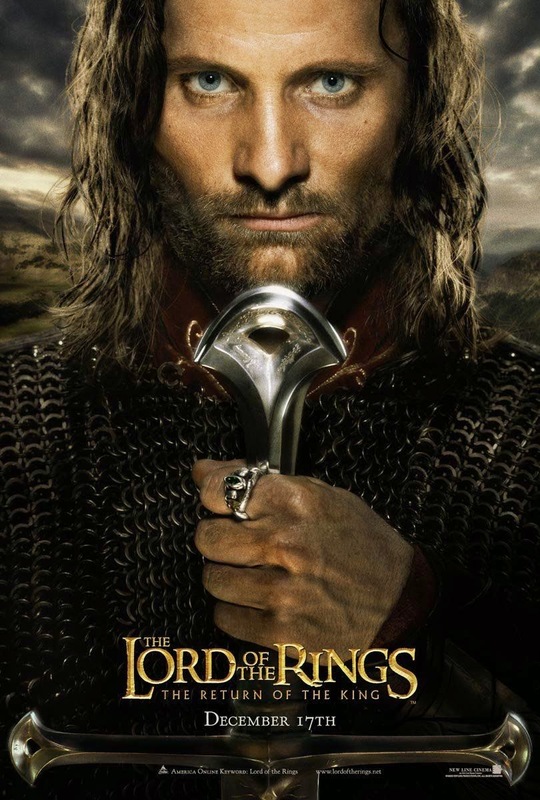 The third and final installment in the Lord of the Rings series is also our favorite, and it is not just BigJ's favorite film in the series, but one of his favorite films period. Winning 11 Academy Awards including Best Picture, it is in a three-way tie for most the most Oscars won by a single film with "Ben Hur" and "Titanic," but it is the only one of the three to do a clean sweep and win in every category it was nominated. It definitely deserved to sweep. At this point in the Lord of the Rings trilogy, most of the characters, with the exception of a few, have already been introduced and now, they are bringing the whole series to its conclusion. This segment focuses on the battle for Gondor, as well as Frodo and Sam's trek through Mordor to Mount Doom. A lot of people think that this final installment is overrated, but we love the end of the movie once they reach the mountain. The Gondor battle in this film is very similar to the Battle at Helm's Deep in "The Two Towers," but it's done on an even grander scale, if that's even possible. It's on a more wide open field and involves many other elements beyond just Orcs trying to break through a wall. As awesome as all these scenes are, one of our favorite moments in the movie isn't a grand battle scene, but is when Denathor, played by John Noble, sends his son Faramir, played by David Wenhem, to lead a charge against an army of Mordor that vastly outnumbers him, which would mean almost certain death. This all happens to the tune of "Pippin's Song," sung by Billy Boyd, which is a somber song about leaving home and heading on a trail into darkness and memories fading. The first time BigJ saw this scene, it gave him chills. It is truly emotional and absolutely powerful, and is one of the greatest scenes in the trilogy. Though there are many instances of heroism in this franchise, we believe that "The Return of the King" finally reveals the ultimate true hero of Middle Earth, and that's good ol' Samwise Gamgee, again, played by Sean Astin. Sam shows huge amounts of bravery and saves Frodo's life on multiple occasions. He has a level of loyalty unmatched by any other character in the franchise. Frodo would have most certainly died if it wasn't for Sam. This film as a whole brings an unmatched level of excitement and entertainment with a satisfying ending, but also brings a sense of "what am I going to watch now that it's over?" to its viewers. Mystic, awe-inspiring, imaginative, groundbreaking, and downright amazing, The Lord of the Rings trilogy remains one of our favorites to date and one we can watch again and again for years to come.